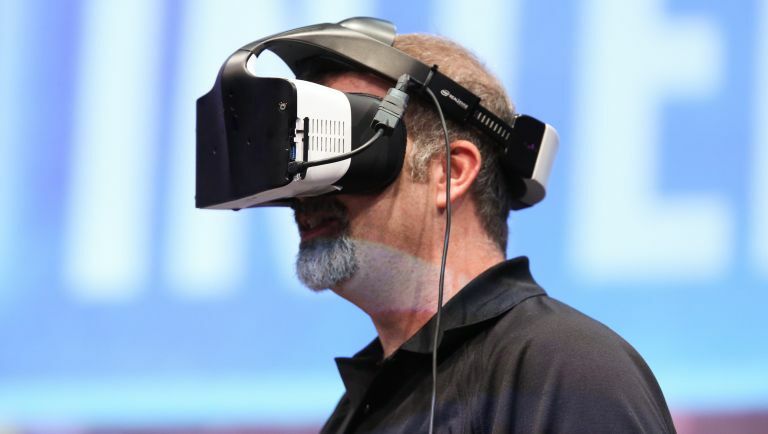 Intel has taken the wraps of its very own virtual and augmented reality headset that does something the competition doesn't - it's wire free, doesn't require a connected smartphone yet can see the real world around it. Yup, Project Alloy has it all built-in meaning processors, motion sensors and battery right there on the wearer's head. There's also Intel RealSense cameras to allow Alloy to create augmented reality situations and more. The idea behind Intel Project Alloy is to offer a wire-free experience so the user can move freely in the real world allowing them unlimited movement in the virtual one. Currently powerful headsets like Oculus Rift and HTC Vive require a wired connection to a PC in order to run. That said Samsung's Gear VR uses a smartphone placed in the headset to offer virtual reality, albeit at a lower graphical level for gaming. It is unclear at this early stage just how powerful Project Alloy hardware will be. It's also unclear just how weighty this setup will be when sat on the wearer's nose. One of the great things about Project Alloy is its ability to track its surrounding. That means you should theoretically be able to move about inside a room with the headset spotting obstacles that it can mimic in the virtual world. At the moment the competition for movement friendly VR, like HTC Vive, requires sensors in the room so the headset can know where it is in relation to the walls, so you don't headbutt them. Intel says that Project Alloy is even able to detect the wearer's hands so that they can interact with the virtual world, minus controllers or gloves. Want to open a virtual door? Simply reach out and do it as if it were really there. This is largely thanks to Intel's already well developed RealSense cameras which are able to sense depth and 3D model the world in great detail. Thanks to those impressive RealSense cameras, Intel says Project Alloy will allow the wearer to interact with real world objects that are doubled in the virtual world. So from picking up a real-world toy sword that appears in the virtual game to opening a real door to move between virtual castle halls - it's all possible. Intel has even set up its own VR studios called Intel Tech Experience Labs, over in LA. The plan is to create virtual reality experiences specifically for sports and entertainment, says Intel chief Brian Krzanich. It's been claimed by VentureBeat that Intel is also using its 360-degree replay tech meaning viewers could see NBA games from varying angles of the court. At the moment all Intel is saying is that Project Alloy hardware will be available to partners in the back end of 2017. That should mean we likely won't see anything until 2018 at the earliest. Pricing has not been even mentioned. This likely depends on which partners use the headset, for what and how. Here's hoping it's affordable enough for everyone to enjoy.